Delete or rename acr_logo.bik, ubi_logo.bik, abstergo_logo.bik. Go to the language folder that relates to the language your game is in and delete or rename warning_disclaimer.bik. Scroll to the AMD CrossFire section, choose AMD CrossFire Mode to 'Use AMD pre-defined profile', search for Black Flag (ACFC.exe) and choose it. Download and launch NVIDIA Profile Inspector. 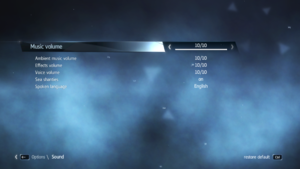 Avoid using Black Flag's profile as it causes some movies (hacked animus movies, intro, etc.) to glitch out and go all green. 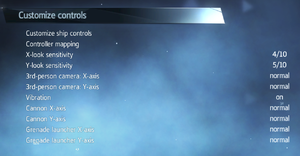 Open AssassinRogue.ini and set EnvironmentQuality= to EnvironmentQuality=4 and TextureQuality= to TextureQuality=2. Save and set the file to Read only. Make sure you set your desired settings and resolution before this tweak. 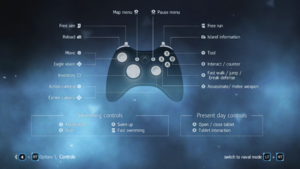 Pressing the touchpad brings up the world menu. 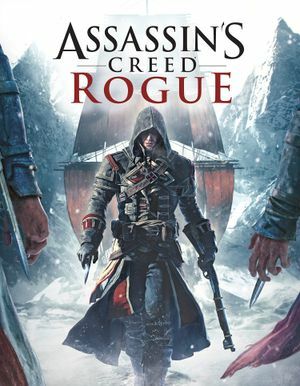 Use Helix Mod: Assassin's Creed Rogue (DX11). 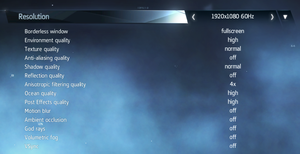 This problem seems to affect only AMD users with R9 200&300 Series cards with the Crimson driver installed. Download an archive from Nexus (or take atidxx64.dll, aticfx64.dll, aticfx32.dll and atidxx32.dll from pre-Crimson driver yourself). Check do you have 32 or 64-bit system. Copy the correct files (those files have either 32 or 64 in the file name which tells what system it is for and you need both files with the same number) to the installation folder (where ACC.exe is located). Start the game, put Enviroment Quality to Very High and load your save. 32-bit systems are not supported. Supported video cards at time of release: Nvidia GeForce GTS 450 or better, GeForce 500-900 series, AMD Radeon HD 5670 or better, Radeon HD 6000, 7000, R7, R9 series, Intel HD4600, HD5200. Laptop versions of these cards may work but are not officially supported. ↑ 1.0 1.1 File/folder structure within this directory reflects the path(s) listed for Windows and/or Steam game data (use Wine regedit to access Windows registry paths). Games with Steam Cloud support may store data in ~/.steam/steam/userdata/<user-id>/311560/ in addition to or instead of this directory. The app ID (311560) may differ in some cases. Treat backslashes as forward slashes. See the glossary page for details. This page was last edited on 13 April 2019, at 01:18.